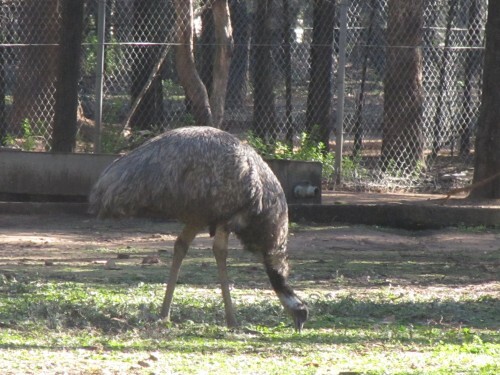 It is always good to see an Emu, one of Australia’s iconic birds while travelling around this wonderful country of ours. There have been many times when we have seen literally hundreds of these large birds in the one place. At other times we only see them singly, or in small loose flocks up to a dozen or so. The bird in the photo above was a single individual on the side of the road we travelled through the open range zoo, the Western Plains Zoo at Dubbo in central New South Wales. I don’t know if this bird is a captive bird making up a part of the display of animals in the zoo, or if it is a wild bird that has adapted to the easy life inside the zoo perimeter. Whatever the situation, it was quite at ease in its environment and not at all concerned about our car driving along just a few metres away.